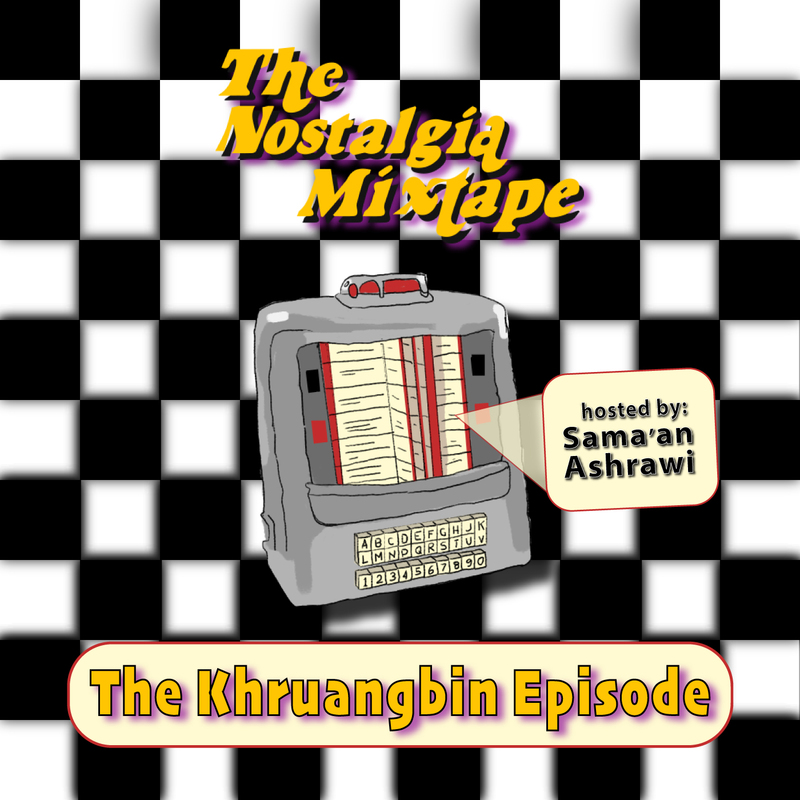 Khruangbin interview on The Nostalgia Mixtape podcast hosted by Sama’an Ashrawi. Tag along as Khruangbin regale us with stories of songs that have chased them around the world, from Texas to Copenhagen to India, and hear about how they grew (as musicians and as people) along the way. Stream the Khruangbin interview via Apple, Spotify, or find your other preferred streaming service here. Don’t forget to follow the band on Twitter, Instagram, and Facebook. Sama’an Ashrawi: And then how do y’all introduce yourselves together as a band? Do you say “Khruangbin” together at the same time or…? Laura Lee: It never works. Sama’an: You never do that? Mark Speer: [extremely radio announcer voice] WE’RE KROONGBIN! SHEH-SHAH! Laura: Yeah usually one of us will do it. DJ: Usually Laura because she has the best sultry voice. Listen. Do it again? Say somethin’. Laura: [extremely sultry voice] Hiii, this is Laura Lee from Khruangbin. Mark: Did it just get louder? Mark: [extremely radio announcer voice again] HEY! THIS IS KHRUANGBIN AND YOU’RE LISTENING TO THE MUSIC MEMORIES PODCAAAAST. Sama’an: That was one of their early tracks called “Bin Bin.” I had halfway forgotten about that moment until 2018, a few nights before one of two sold out shows at Music Hall of Williamsburg in Brooklyn. I was searching through my tweets to see what was the earliest mention I had ever made of them on Twitter; saw some tweets from 2016 and I was like “Okay, that makes sense,” but then I kept scrolling and there were earlier and earlier mentions of them, and I was like, “Okay, I’m even surprised that I was ahead of the curve on this,” and then, “boom,” I found tweets from 2011. It was their performance at Texas Student TV. I was like, “Oh my gosh, I totally forgot that had happened.” So when I talked to them that night, I brought it up, and they– all of our minds were blown because I think they had forgotten that that happened, too. [laughs] We were just like, “Oh my gosh, we actually met like seven years ago.” But I knew from then that I was gonna be a life-long fan of Khruangbin’s music, I just had no idea how many other people around the world would become fans too. It’s really incredible. 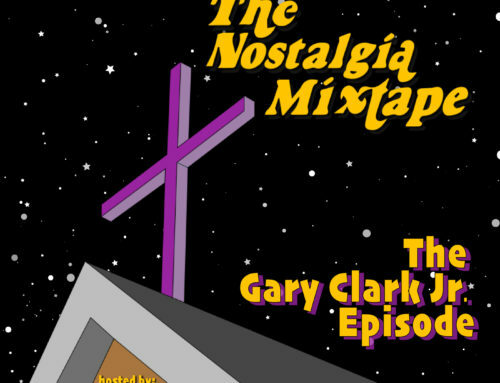 So with that in mind, here’s a dreamy and silly trip down memory lane with DJ, Laura, and Mark…. Together known as Khruangbin. DJ: The rest of the way to Lake Jackson. On repeat. Sama’an: That actually sounds kind of terrible. DJ: I, politely, I asked her, I was like, [high-pitched voice] “You mind if we listen to this again? I just can’t get enough of this bass line.” So I got kinda stuck with it and I was like, “This is really, really good.” And I think the next time I played it, we were all together on tour in Copenhagen. Laura: Yeah. In, I think, April of 2016. Sama’an: How were y’all feeling as people and as a band in 2016? DJ: I think that when things were kind of first getting started for us because I first went over to… We did our first show outside of the United States in November of 2015. We went over and did a short run in the U.K. and it was when our album [The Universe Smiles Upon You] came out. We were there for maybe like 10 days, and we played… how many shows did we do? Laura: Maybe like four or five. Not much. DJ: Yeah, four or five shows, and it was really special. It was a super exciting time for us, me especially because it was my first time really out of the country, using my passport, playing music, and meeting all these people with the British accents, and just kind of diving into the culture. It was cool. Laura: Yeah. It was a crazy time. It was scary because life was changing for all of us in different ways, but we were all coming together and doing this thing that was really meaningful and obviously still is. But that beginning, you don’t know what’s gonna happen, more than ever. I mean, you still don’t know what’s gonna happen, but, we were all sort of taking leaps of faith in that tour. I quit my job. Ya know… cross your fingers and hope for the best. You sort of feel high on life because you’ve made that leap and you know that the possibilities are great, but they’re also scary, and I’ll never forget that little bubble of time. Laura: We were on tour for two months on that run. Two months in Europe was way too long, but it sort of broke us in the best way. Mark: We were on tour with a really fantastic band and we learned a lot about what to do onstage and how to do it. And yeah we got very van-lirious because we’re chasing a tour bus across Europe. Mark: The funny thing is, the previous November when we were playing those four or five shows in the U.K. is when we were on the BBC. And that’s where we played with Father John Misty. DJ: We met FJM on that show. Mark: A huge leap. So we tried to have fun as much as we could and that song (“Gonna Get Over You”) definitely was fun. Sama’an: How does that feel making these huge leaps in terms of knowledge and growth? Are you ready for it? Or do you just buckle up? DJ: I don’t think you’re ever “ready” because it’s always more than you can imagine to be. You just kinda… when it comes you’re just like, “Alright! Here we go!” Put on your guitar, grab your drum sticks, and here we go! It’s a thing. It’s been a wild ride, a good one though. Laura: I actually… I remember DJ showing me this song and he’s like, “I think you’re gonna LOVE this song.” Because Nina, DJ’s wife, loves this song, he’s like, “She can’t stop listening to this song.” Now I’m hearing the story, it was DJ who couldn’t stop listening to the song! Laura: It was a memorable day. It was a memorable tour for us, it was our first tour ever, and we were on the road with Father John Misty, and we were delirious because the road is that way. And I loved it, I loved that song. I would frequently sort of do the catwalk backstage to keep myself awake because I would be tired. So I would be like, “I’m gonna walk for you guys.” I would pick a song and then I’d walk, sometimes I would eat a sandwich while I would walk or something. The day I walked to France Joli my hair was all messed up, and I only had one shoe on. Laura: Yeah but it was GREAT. Laura: I think Mark caught it on video. Laura: And in the video I do that at the very end, and so it became this video that we were constantly playing for each other to hear that laugh at the end. But also the song. It was just a really memorable moment. Laura: And I spent the EXTRA cash. I got the good copy. Mark: Yeah. Very Good Plus. Laura: VERY Good Plus. [laughs] And then it comes in the mail and it’s the Spanish version. Mark: It’s still jammin’ though. Sama’an: It’s still jam– right! It still jams. Laura: But you know I put it on and I was like… [shudders] And now actually we play [the Spanish version] it’s great. Mark: We play it. Because people are hip to that song, so when we play it, they’re like, “Oh, they’re playing France Joli…” And then she’s singing in Spanish and they’re like, “Where’d you get THIS version?” Like, that’s a deep cut. Ey, but it came with an instrumental on the B-Side, so that’s tight. Sama’an: Which is where France Joli is from! That’s so perfect. Laura: It did not go off! Sama’an: Not the same crowd, apparently. Mark: Yeah… Yeah. We were abouuuut thirty years too late. If we played that in her prime, it would’ve gone… insane. DJ: We kicked it off [sings opening notes] and it’s like…. Three people in the room that are gettin’ it, and it’s US! Sama’an: So this specific moment was your European tour, right? Were there any records you discovered on that tour? Or records you had been looking for that you found? Mark: Like, actual physical records? Mark: We did have zero time for record shopping on that run because you’re just basically chasing a tour bus and hoping to show up on time for load-in. So, there wasn’t any time to go exploring. DJ: She didn’t hear it [at first.] I was sittin’ there and I was like, “Do you hear that?” And she’s like, “Hear what?” And I was like, “Listen…” And she was like, “Oh my god! !” It just kind of followed us around. Sama’an: How does that song go? I’ve never heard it. Laura: Because we didn’t have that many adventures on that run, that morning — we did two nights in Copenhagen and it was DJ’s first time in Europe — Mark was asleep and we were in an AirBnB and in the apartment above us, there was like a seven year old kid learning how to play drums. It was that like practicing drums thing. DJ: I forgot about that. Sama’an: I’m so sorry, man, that probably drove you crazy. Laura: Mark’s good about, when he’s determined to sleep, he’ll just keep doing it. Mark: Oh, yeah I’m a good sleeper. Sama’an: [laughs] That’s pretty adventurous! DJ: It was beaauuutiful. It was like on a harbor or something. Laura: Yeah, it was on the water. Huge spread. One of the nicest buffet spreads I’ve ever seen. Think it was probably really expensive. Sama’an: Can you walk me there? Like, visually, can you describe… from where you were staying to the place? DJ: It wasn’t far. It was like, walk out of the door, walk down the street, maybe hung a few turns, and it seemed like we arrived there and there were all these people kinda brunchin’ and hangin’ out. Laura: It was sunny. Waterfront. The architecture in Copenhagen is very like… Amsterdam-y, kind of? That’s the only thing I could compare it to, but it’s its own breed of style. There was a lot of fish on the spread. I don’t even know what it was. DJ: There was this ice cream that I had at the end. DJ: It was really good. Laura: And then as we were leaving, the song came on. And we went and told Mark about our moment. Woke him up, and did the show again! I think it was actually that day that the France Joli walk happened. Mark: It was because I was still sleepy, and what’s the pose I was doing on the floor of the dressing room? Sama’an: It wasn’t Lion’s Pose. Mark: [laughs] NOOOO. Basically just me savasaning [editor’s note: NEW WORD ALERT] on the floor of the dressing room. Sama’an: And what’s the energy of the band that night? DJ: It was playful, I would say, mainly because of Laura Lee. I think for her, having to catwalk, it was probably really low energy, so she catwalks to get everybody going and gettin’ ready. And after that happened, it lifted everyone’s spirits, and then you know you just go out and do your thing. Mark: Copenhagen is remembered in Khruangbin as one of our favorite places to play because the audience is so great. DJ: And, aw man, so after this show, I think we had a day off the next day, so on the road we call that “Roadie Friday” because everyone just kind of lets loose because you don’t have to work the next day. And we went to this spot called War Pigs. Mark: They were playing just like old Rockabilly. Sama’an: That sounds like a dream. Mark: It was cranked! Like club volume. Mark: But the thing is there’s no bass, it’s all mids, and people were just going absolutely insane. Thanks for tonight, you are all awesome. Sama’an: It was like out of Grease or something. DJ: I’ve never seen anyone like dance that hard to just like “Rock Around The Clock,” just dancin’ on tables, doin’ the twist, just… the entire room of people… just… insane. DJ: Yeah it was a party. DJ: Yeeaahh… The music was that loud. It was insane, man. Mark: And then, you know, he’s bookending the set with like, Queen. Sama’an: That sounds like a religious experience. DJ: It really was. Yeah. Like everyone’s singin’ together. It was one of those nights. DJ: War Pigs. If you’re ever in Copenhagen, you gotta go to War Pigs. 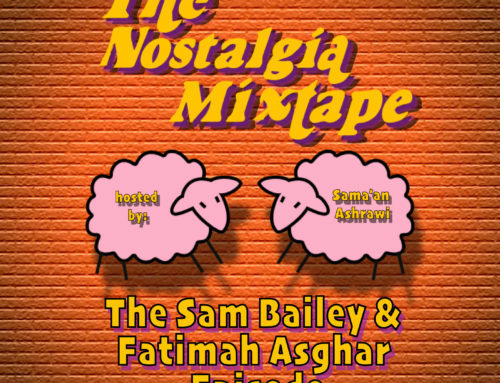 Sama’an: Yeah, whenever I am lucky enough to DJ a house party, I like to try and throw a little Rockabilly medley in there just to prove that you can still dance to it. Sama’an: Know what I mean? Sama’an: You don’t hear it enough. Sama’an: Anyway, that was a personal aside. Sama’an: Have y’all had a moment where you found a special record on the road? Maybe outside of the country, outside of the U.S.? Laura: Aw man, so many. Mark: Oh man, Laura Lee tells this story the best. I can’t tell this story. 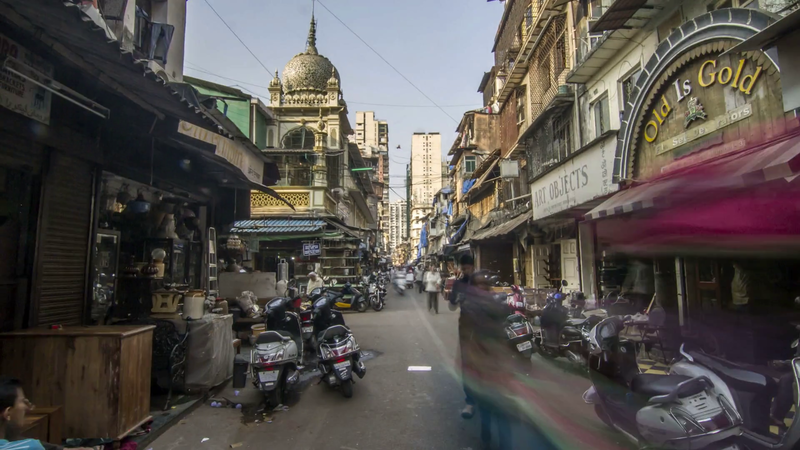 Laura: Well, we were in– Mark wanted to go record shopping in India, obviously, and we asked around. We played an Indian festival, [and] we asked where we should go, and everybody kind of said, “You really need to go with somebody,” but we were gonna do our best to find stuff on our own, so we went to… what’s the bazaar called? Chor Bazaar? Mark: Yeah I think it was Chor Bazaar. Mark: The Plumbing Street, the street where you just get the back fender for your moped. Like that’s all they sell. Mark: We were getting closer. Mark: So we paid ten dollars and we were out the door. Laura: And also in Thailand we went to ZudRangMa. ZudRangMa in Bangkok, Thailand. 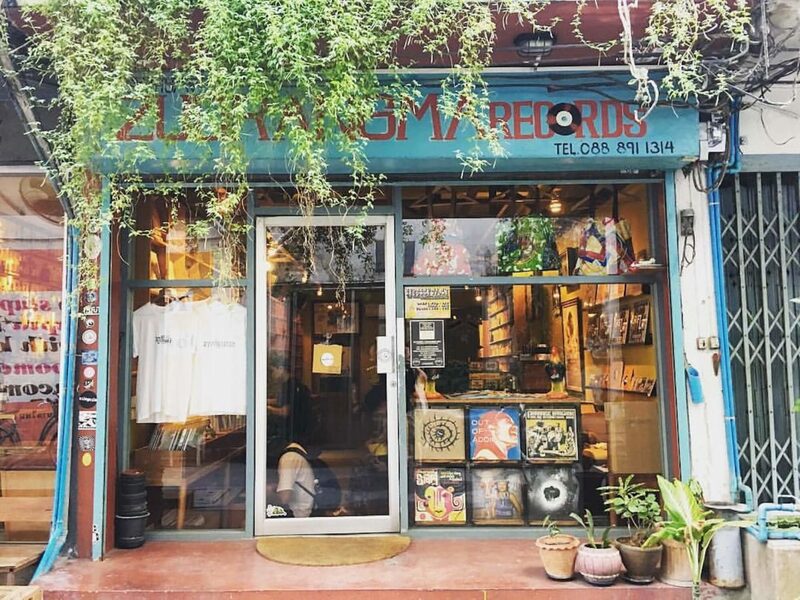 Considered one of the world’s best record stores. Laura: One of the best record stores I’ve ever seen in my life. You know when you usually go to the “International Section,” it’s the smallest section in the room– this is only that. Laura: Oh yeah, “Gole Yakh.” Which was one of the first Persian songs we listened to. Laura: I had asked a friend who’s Persian to ask her family to make a playlist for me. I actually didn’t really like any of the songs on there except for “Gole Yakh.” I played it for Mark and I was like, “This is the most beautiful song.” It was in rotation forever and then going to Thailand to find an original record from Iran, I don’t know, it kind of blew my mind. I never thought I would ever see that 45. And it was way more than I would normally pay for a record, and I probably won’t listen to it because it’s not in great condition, but it was something I would have been sad that I didn’t buy. Sama’an: It was like a very divine experience. That’s so cool. 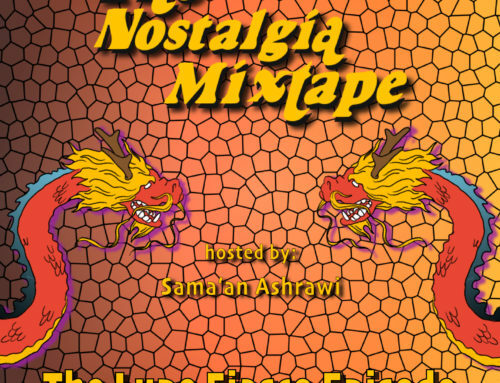 Sama’an: I remember several years back when DJ was telling me that y’all had been getting into Persian music — Iranian music — I sent him the Pomegranates mixtape or whatever, which was a life-changing compilation for me. Sama’an: Is there also maybe like one record or compilation for y’all that sparked your interest in psychedelic music from that region? Mark: Hmm. What was it that got me going? It was Googoosh. Mark: “Ma Be Ham Nemiserim.” [sic] That’s what I think I heard on that app where you can kinda just pick a country, pick a decade, and it plays you jams from then. I was like, “What is this? This is amazing.” It couldn’t have been too long after Father John Misty because that’s where I actually learned about that app. DJ: Yeah, we were in the U.K.
Mark: I was like, “This is it right here.” And then I was like, “Well, if there’s this, then there’s gotta be other stuff like it. So I gotta find more.” And then I was just in love with Googoosh. Laura: And we’re going to see her next week. Sama’an: Whaaaat? Where is she playing? Sama’an: Woooooow. That’s really special. Mark: Dude. I am fanboying out right now. Sama’an: How old is she by now? Sama’an: Yeah. There’s no age for her. Sama’an: And that is what made my dad a fan of y’all! So it was a really cool full-circle moment. Laura: Ohhh that is so cool. That’s amazing. Sama’an: I’m still in the process of that whole thing, as DJ knows, but we’ll work on that. We’ll try and get y’all some of my dad’s music, too, whenever we can make that happen. Sama’an: I have a couple of random questions for y’all. Were any of y’all into comic books or superheroes growing up? DJ: I was into X-Men like the cartoon. I really dug the cartoon, I wasn’t into the comic books, but yeah. Laura: No… I mean, there’s people that could be superheroes to you but they’re not traditionally. Laura: Cassandra from Wayne’s World. Mark: She’s definitely a superhero. Sama’an: Was she the one with the gun rack? Sama’an: [laughs] I don’t even own ah gun! Sama’an: Okay, Cassandra, right. Cassandra– no she is a superhero. Laura: She is a superhero. Mark: Cassandra played bass in Crucial Taunt. Laura: Crucial Taunt or Crucial Tonic? Mark: Was it Crucial Taunt or Crucial Taint? Sama’an: Yeah, she looks angelic in that movie when she’s on-stage. Laura: [laughs] It’s very clear inspiration. Laura: She plays bass. I mean, it was never intentional, but I was watching her the other day and I was like, “Oh, right! I totally watched this a lot as a kid.” I’m sure there was a subconscious thread that went in there. Mark: [in Cassandra’s voice] The whammy bah. Laura: Mhm, yeah. She’s like epic. She like hangs out with the Wayne’s World dudes, goes and sees the Strat and knows all the facts about the… [laughs] I forgot, you know it. Do you know the line? Mark: I don’t remember the line, but it’s amazing though. Laura: Oh it’s so good. Mark: “Take the buzz out the low E” or something. Sama’an: Do y’all remember any of her songs from that movie? Mark: “Ballroom Blitz.” Sweet cover. Sama’an: I can like see her face right now in my head when she’s singin’ that. Mark: The snake’s falling asleep! Sama’an: Ohhh mann! We gotta fix that!! Laura: [singing again] Love the way that you love me. DJ: Yeah, I’ve never seen it. We gotta carve out some time to watch. DJ: That’s what we tend to do, like, if there’s a movie that everyone in the world has seen, and I haven’t seen it, we’ll sit down and watch it together. I remember we sat down and watched What About Bob in the U.K. once. Mark: Oh yeah. Great, great movie. Sama’an: Do any of y’all have UFO stories? Or theories about UFOs? Sama’an: [laughing nervously] Why are you laughing over there, Mark? Mark: Yeah, I’m checkin’ out the show, man! Mark & DJ: With the glassy eye! Mark: …because that’s the guy right there. My favorite UFO story is that, you know, CIA was doing like, not “mind control” experiments, but like “remote viewing” experiments? Mark: So they had like a psychic or a remote viewer or whatever sitting in a room, and they give him an envelope. It’s a sealed envelope, right? So they ask him these questions, like, they give him coordinates and they ask him to describe the coordinates. So he’s describing these coordinates, he’s like, “There’s huge structures, there’s these really tall people, and their planet’s dying! They’re hiding in these huge underground, kinda like pyramids but they’re not really pyramids, but there’s all this stuff happening. They’ve sent some people to go find another place to live, and they’re waiting for them to come back.” It’s all this stuff, it goes on for a while, and they open up the envelope, and it says the location of the remote viewing is supposed to be: Mars, one million years ago. Mark: And I’m like…. Makes sense to me, dude! Mark: People are like, “Where are the aliens?” WE’RE the aliens. Mark: I mean, why not? Sama’an: Or like, have y’all ever seen Blue Planet? That documentary, Blue Planet? 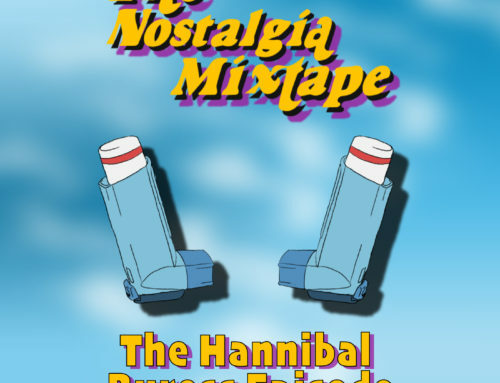 Sama’an: My favorite episode is the one where they go to the bottom of the ocean because I feel like that’s where the aliens really are. We don’t know anything about the bottom of the ocean. Mark: It’s deep. It’s very deep. Sama’an: Good I’m glad we had that talk. Sama’an: I’m glad we shared that moment together. That’s really special. Sama’an: And like for sure no one has seen every inch of that forest, right? Sama’an: WHAT IF they put in the wrong coordinates and they ended up in the middle of a forest in the 1700s when there wasn’t as much civilization, they got lost, and there’s a time machine sitting out there somewhere in a forest?!? We gotta go find it!!! Mark: I could see that. Sama’an: It checks out, right?! Mark: I mean probably, to be fair, it’s probably at the bottom of the ocean. Mark: It’s in the Marianna Trench, that’s where it’s at. Sama’an: Final question: This song by France Joli, “Gonna Get Over You.” Pretty relatable topic for anyone who’s been in some kind of relationship. What’s the perfect balance between reminiscing and trying to live in the moment? Mark: I mean, I don’t have an answer for that. Is there? Is there a balance? Mark: That in itself is a moment, you know? Mark: Know what I mean? Like in the present? Sama’an: That’s a fair question! Mark: Do you mean like, do I need to be hip to what’s happening all across the world, right now today? Or… is it more like… what’s happening right now? Sama’an: It’s nice to reminisce sometimes about good moments you shared with someone or with people, but, you can’t do that all the time, right? Mark: I mean, I don’t wanna live in the past. DJ: I think reminiscing, which is really what we just did for the last… what, 45 minutes now? I think reminiscing helps you appreciate Now more than anything. Sama’an: Oohh that’s so true! That’s a really good way to put it. Laura: He’s always in with the banger answers. Sama’an: That was really solid, man. Sama’an: Hey y’all, thanks so much for coming on the podcast. Laura: Aw, thanks for having us. DJ: Thanks for having us, this was fun. Laura: I’m gonna try out that biscuit-jam-egg-thing. Sama’an: Yeah, like cut the biscuit in half… do you get it? Laura: I get it. Mhm. Sama’an: Then put the jam and eggs… okay cool. Mark: You have to try the ginger jam, though. Sama’an: That’s a fair trade! Sama’an: Where do I get ginger jam? Laura: I think you can get it at like Randall’s. Mark: If not that, maybe a Cost Plus World Market or something. Laura: I mean you can definitely I’m sure find it at Whole Foods. Mark: Is it in the jar with the writing on it? Laura: It is. It’s a nice writing. It’s like a fancy package with a silver lid? Laura: I’ll fact check that for you, you can fact check the name of Cassandra’s band. We’ll be straight. Sama’an: We’ll hold each other accountable! Sama’an: Thank y’all so much. Laura: That was really nice. Sama’an: So, Khruangbin’s story about the Rockabilly dance club in Copenhagen reminds me of a similarly religious experience I had in Santiago, Chile, in 2015….. I was there, with some friends, visiting Ana Tijoux, who is a friend of mine and also is maybe, arguably one of the most impactful South American rappers of all-time? It’s not for me to say, I’m very biased, but, I think you can make that argument. Within a half hour, this guy had assembled a wooden pyramid of speakers– taller than me, and I’m 6’2” on a good day. The bottom row was for the bass, the low frequencies, the middle row was for the mids, and the top row was for the highs. And when the room filled up, and it got really smoky, it was like being in church. I’m talking about people were trying to move closer to the pyramid, just so they could feel the bass pumping through them. It was incredible. I’ll never forget, about halfway through the night, this PULSING bass line comes out of the pyramid. It was a record called “Mandela” by Peter Youthman. All the music that night was great, but this was the one that made it feel like we really were in church. People in waves were moving up to the speakers and then moving away; walking up to the pyramid, and then moving back, and some people were just — as soon as that song came on — frozen in their place with their head cocked back. Like, they were only there physically, but mentally they had gone somewhere else. You really can’t tell me we weren’t all in church that night. It was incredible. It’s amazing when music can take you places, mentally, emotionally, even metaphysically; and, for Khruangbin, geographically too. They’ve become known for — like I mentioned earlier — their covers of songs from the Middle East from the 60s and 70s. If people are discovering artists like Elias Rahbani or Googoosh or whoever through Khruangbin’s covers, I think that’s a net positive. So, thanks for listening, y’all, I’m your host, Sama’an Ashrawi; this episode was recorded and produced by Jason Crow and Jasmine Chen. Did you enjoy the Khruangbin interview on The Nostaliga Mixtape? Bless your ears with the official Khruangbin playlist companion. Listen on Spotify, Apple Music, and Tidal. 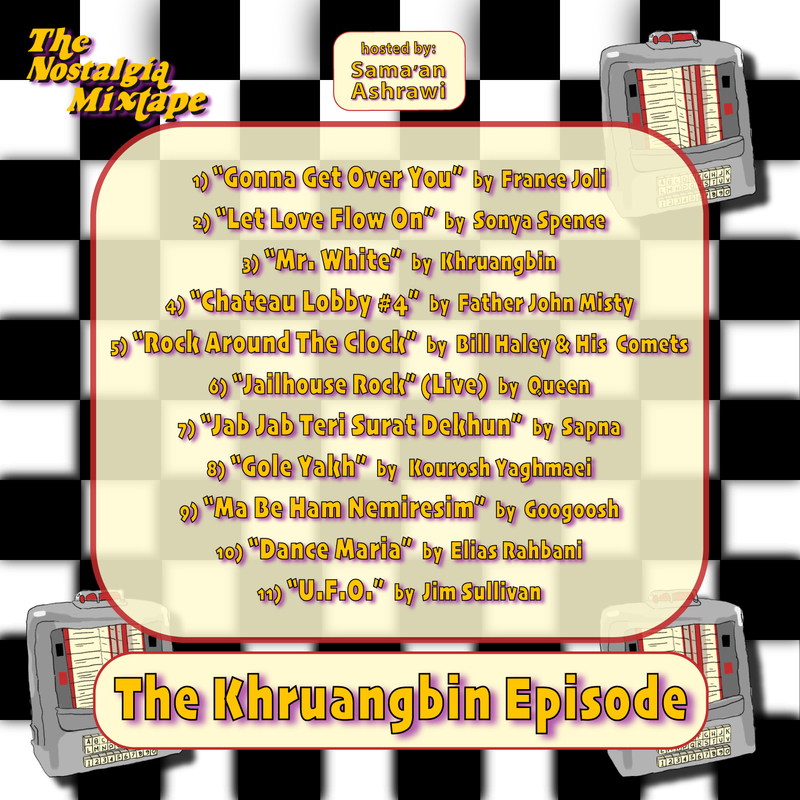 Tracklist for the Khruangbin Nostalgia Mixtape podcast hosted by Sama’an Ashrawi.